According to the author, "A nearby corporate laboratory has been participating in humane animal experiments for the betterment of mankind." You and your team, being tree-hugging members of the great hippy generation, decide to storm the laboratories and free the cute little animals, regardless of the human lives saved by the research. Your mission is to save the cuddlies without releasing any deadly mutating viruses. You start out in a darkened control center with a bunch of weapons and ammo. You enter the giant vestibule on the main floor of the corporate building. There are mean security guards here who do not like hippy scum. They attack you as you try to make your way to the balcony. Then up you go to another balcony where S.W.A.T. members attempt to wash you with bullets. Finally, you make your way to an elevator that takes you up to a large briefing room for the evil corporate laboratory. You fight your way to the lab and stupidly set free all the biohazardous microscopic vermin. Next, you are warned to shut off the fans before proceeding. A door is now available in the main spawning area that opens into the briefing room. Eventually, you must vent down to a room where containment bots are waiting to have their parts rearranged by your environmentally friendly team. You encounter some mutated dogs, who since they are trying to eat you, no longer seem cuddly. You happily find the pens where they keep the animals, however, the animals want to splash you with flesh disolving gunk that they shoot from their mouths. Sadly you must destroy these poor beasts. Then you must figure out a way to disengage the security system in the control room. Search the entire area and you will find a way. Of course this lets out a Super Mega Containment Zord who must be dealt with before going up to the main computer control room. In the computer control room, you must find a way to open the door at the top of the lift. You must blast away somewhere in this room to find a way into the door above the lift. Once through the doors, you must pass the Airborne Containment Bots and since the doors to the lab are locked, you must find your way somehow using the elevator. You must break into the bio-lab computers and turn off the power. Then go to the underground water storate tanks. However, as you get there, more airborne bots attack you. You dive into the algae ridden tank and might get killed by Eurgh the gonome as you surface. 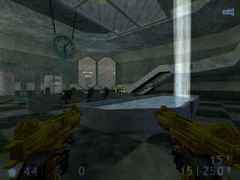 You will go through a lighted tunnel where three jack-booted security guards decide to use you for target practice. You then arrive at the high containment area where you must again deactivate the security system. You find a control room and are warned not to push any buttons, but of course you do. This lets out all the mistreated animals from their pens. You wish your friends of the forest well as they attack you with glee. Since they were all running amock, the security people decide to activate the self-destruct mechanism. It's pretty tough getting away from all all of the crazed pets. You make your way to a lighted tunnel area and up some stairs to an exit to the city steet above, where a team of swats is waiting to tune you up and take you away in the police van. Finally, a map with a good story line. The storyline is humorous and the author has worked in some custom models such as the mutated dogs to keep in line with the premise. The large lobby in the begining looks well built. The weapons were adequate for the job. From what I understand, this is only the author's second released map. Based on that fact, I'd say he did an excellent job. Most of my testing was done on the Beta 1 version. The author replied on the Sven Co-op Map Showcase and fixed problems with the Beta 2 version. The city street scene at the end looks great. The map was way to dark for my liking. This might be in keeping with the premise of a damaged building, however, I still would have liked a little more light.